Sitting here on a sun dappled morning looking out over green hills and children and horses playing in the arena – I take a deep breath of gratitude for where and when I live. At my feet is our 13 year old hound mix Tucker. He’s as devoted a dog as I’ve ever known in my life. He’s a quiet dog, and like I said, loyal to a fault. He’s sweet with the kids and loves to run and play. He’s safe with the horses and never bothers the cats. He’s also extremely anxious when left alone, a food hoarder, he buries things and he kills chickens. My husband and I laugh about what a good dog he is – we adore him. 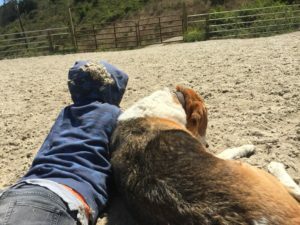 We know that if Tucker lived in the suburbs and was confined to the less than 110 acres he lives in now, if his family worked normal hours and left him alone for 40+ hours per week, he would be unmanageable. He would dig, chew, steal and bury food. He’d destroy furniture. He’d bark and almost certainly be aggressive to strangers. He’d be passed on to other families or medicated heavily or worse. 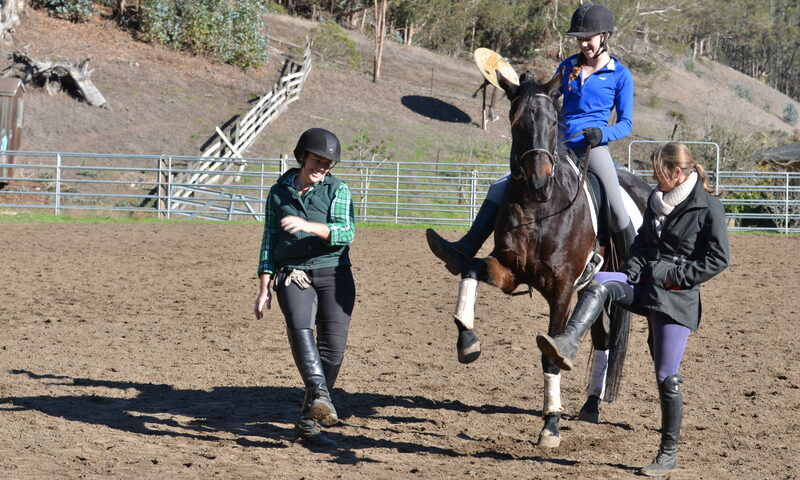 We use ex racehorses in our program. People worry that they are too fragile, too prone to be over-reactive, too tall, too fast. We remind them that racehorses are raised around humans from the first day of their life. They are constantly handled, managed, attended to by people.. Humans are a vital part of their survival plan and their tribe. No other horse in my experience is more keen to please humans than a properly handled ex racehorse. There are exceptions of course. But, like the dog, we’ve managed the horses’ exercise schedule, diet and living situation to match their needs. We’ve planned our training exercises to bring out the best results and we are constantly re-evaluating our approaches as a team. As a result, we get co-operative, kind and responsive horses. If these same horses were locked in a box stall and ridden 3 to 4x per week for 40 minutes at a time, they would be anxious, fearful and some might become aggressive. The key factor here isn’t that Square Peg has some magical lock on animal training. The key factor is Environment. So what’s important for our most vulnerable students? Homo sapiens are designed to move. We can outlast any species on the planet for long distance running. Our big brains need nourishment, sunshine and engagement. Our minds process information and emotions that are complex and dynamic through a mix of physicality and rest. Why then do we demand that children and anyone trying to learn to digest information while being denied physical movement, sunshine and proper supports? Why are pervasive and maladaptive behaviors blamed on the child and not on the environment we’ve forced him to learn in? Why aren’t we looking at sleep and sleep quality before discussing a curriculum for a student? A parent noticed the other day that the horse her son normally rides was much more receptive to being groomed. Truth is, he’d been turned out for the last few days with some of the other geldings. His movement, sensory and social needs had been met and Viola! His behaviors improved. Shocking!! If what we are looking to do in the field of autism education is to find effective and cost efficient therapies to help clients navigate a disrupted sensory system – why aren’t we making damn sure that the sensory, social and physical inputs are being satisfied first? Kudos to all the autism parents who spend every weekend hiking with their kids, taking them to the ocean, the train station, replacing the trampoline for the second time this year. When you need us, we have miles of coastal hills to climb, a score of kind animals to touch and press into and move with, a pond to paddle on, sand to roll in, water to splash, silly stories to listen to and laugh about. When your IEP rolls around – question the environment your child is subjected to. Is it restrictive or does it allow his curiosity to blossom? Is the human environment about being heard or is it about listening? And most importantly – is there laughter in the space?